This is a call for help. There has been a Grange over Sands Royal National Lifeboat Institution Branch Committee since 1926. 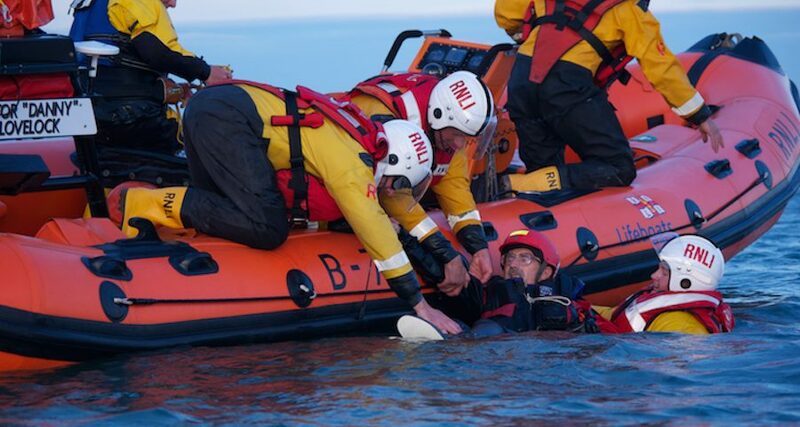 Over the years it has raised thousands of pounds towards the lifeboats, equipment and crew training without which many people would have perished in the seas around our coasts. The RNLI has also been at the forefront of rescue activity in floods, most recently those of December 2015 in Kendal and elsewhere. In 2016, we raised over £5000 from our local community and visitors to our area. Now, however, the present Committee has to face the fact that shrinking numbers through age and infirmity means that unless we can get new, younger people to join the Committee, we will have to close the Branch and end a proud 90 year long history of fund-raising for the Lifeboats in the Grange area. We hope to continue in 2017 on a scaled back basis, concentrating our available effort on the annual RNLI Flag Day, a stall at the Edwardian Festival, a store collection at Booths in Ulverston and our November Coffee Morning. However we are aware that there is so much more that could be done to raise funds for the Lifeboats if there were more people to share the effort, bring fresh ideas and help with the use of social media. We need people to fill three different roles. We need new Committee members, prepared to make about 15 – 20 hours available each year. Please don’t be put off by the word “Committee”, there are only two or three informal meetings a year plus the Branch Annual General Meeting. We need more helpers – people who may not want to commit to membership of the Committee but who are prepared to help with specific events. There is a vacancy for the post of Branch Secretary. This is a key position and requires someone who can offer the time and ability needed to organise events and deal with the requirements of the RNLI at regional level. The next AGM is on 20 March at the Grange Hotel and that’s your opportunity to hear about our activities, to discuss what is involved in being a Committee member, a helper or the Branch Secretary. Please think about attending with a view to volunteering. The RNLI is a charity and is dependent on the kind of fund raising that has been going on in Grange for 90 years – help us to continue that important work and save lives at sea. If you can’t be at the AGM or you’d prefer a more private chat, please ring the Branch Chair, Christine Blakemore on 015395 32385.